Sydney Johnston, career counselor in the Career & Counseling Center, put a lot of time and thought into organizing this year’s internship fair. So, on Wednesday, May 9, the Career & Counseling Center hosted an internship fair in the Dining Commons. Over 40 students stopped by the tables and talked to most, if not all, the recruiters present. Participating organizations included Auberge Resorts, Army Healthcare Team, Lake Berryessa Park Ranger Program, U.S. Navy Chaplain & Medical Programs, Oakville Grocery, Meadowood Luxury Hotel, and OfficeTeam, an international employment agency. Jobs during college can and should be more than just earning money; they can also help boost a student into their desired career path and give them the experience they need to determine whether or not that career is for them. One such employer represented at the internship fair was the Army. 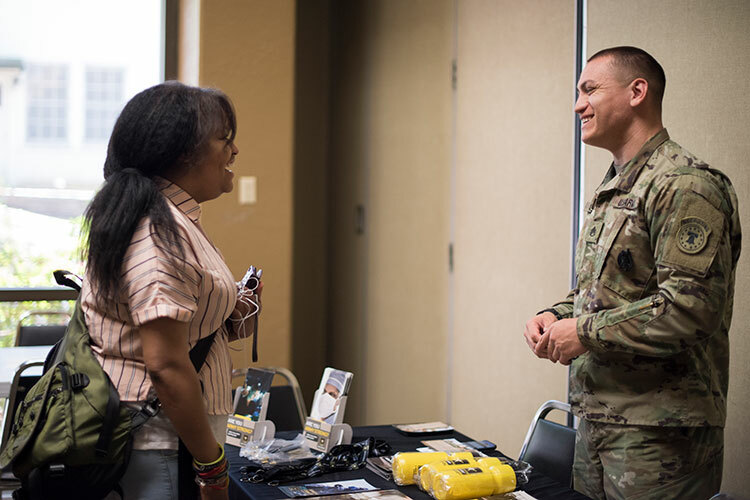 As a part time Army reserve and full time scholar, students are trained for their career of choice while earning student loan repayment. Events like this also put PUC on the map when it comes to employers looking for seasonal employees, interns, and even long-term or full-time job candidates. LBPR is always in need of summer park rangers, which includes a mix of skills and abilities, such as law enforcement (uncommissioned), interpersonal, custodial, and an interest in assisting the natural resource director in the fight against invasive species. Through the LBPR, students can also learn more about USA Jobs and sign up for alerts when jobs that fit their skills and interests are available. Similar to USA Jobs, employment agencies can match individuals to jobs that fit their needs, personalities, and skills. This is why Johnston asked OfficeTeam, a Robert Half Company, to attend the fair, as well. OfficeTeam staff help students perfect their resumes, improve interview and on-the-job skills, and find positions that work with their schedules and abilities. Skills assessments help the agency determine whether an individual can do a particular job, and the results are helpful to OfficeTeam staff as they go to bat for the applicant to find them what they need--be it work during the school year or summer, or a permanent job after graduation. Even if students are going home for the summer, or are looking for employment outside of the local area, companies like OfficeTeam can help. With a global database of employers and open positions, OfficeTeam provides resources wherever the individual may be looking. Anyone who was unable to attend Wednesday’s internship fair can still get what they need through the Career & Counseling Center. Visit puc.edu/counseling-center for a regularly updated list of jobs and internships, as well as other resources. Email career@puc.edu to talk with a counselor about the specific needs and interests you have, or to get help with resume building, interview skills, and more.